This charming 4 bedroom, 3 bathroom finca sits nestled in beautiful mature gardens with apple, orange, lemon, fig and almond trees. A wonderfully private property with large private pool, table tennis, Wifi, House iPad with guest info and other useful information, UK and International TV, Wii, PS4, bikes, games, air-conditioning and for the winter months central heating. Less than 5 minutes from the wonderful old town of Pollenca. The villa features a large open plan area with two seating areas, Dining area, four main bedrooms, 2 en-suite and all with air conditioning. 2 of the doubles can be made into twins on request. There is wifi throughout the house and terraces, TV with full international channels, DVD, Playstation 4 w/games, Wii w/games, lots of classic family movies and comedy DVDs and a Bose bluetooth player and iPad. The kitchen is large and well equipped. Outdoors there are multiple places for relaxing; under the 2 shaded terraces, by the pool, or within the orange and Almond trees. The pool measures 5 metres x 10 metres with Roman Steps. We provide life vests for young children. There are also lots of inflatable playthings. There is also table tennis, four bicycles, with lights, locks and helmets, badminton, kids toys, small library, books on Mallorca, board games such as Scabble, Monopoly, Trivial Pursuit, Backgammon and Jenga. The perfect house for a wonderful Mallorcan holiday. I have lived on the island since 2008. I arrived for a holiday and never left. Cliche I know but true. The north of Mallorca is stunning and the landscape is so varied. Beautiful Mountains and delightful little azure bays. Love it! There are hundreds of rental villas in the north of Mallorca and my parents looked at many to buy before they found and fell in love with Font Xiquita. The house and gardens are magical. So close to Pollenca and Puerto Pollenca but when you're in the house or by the pool you feel a million miles from anywhere. 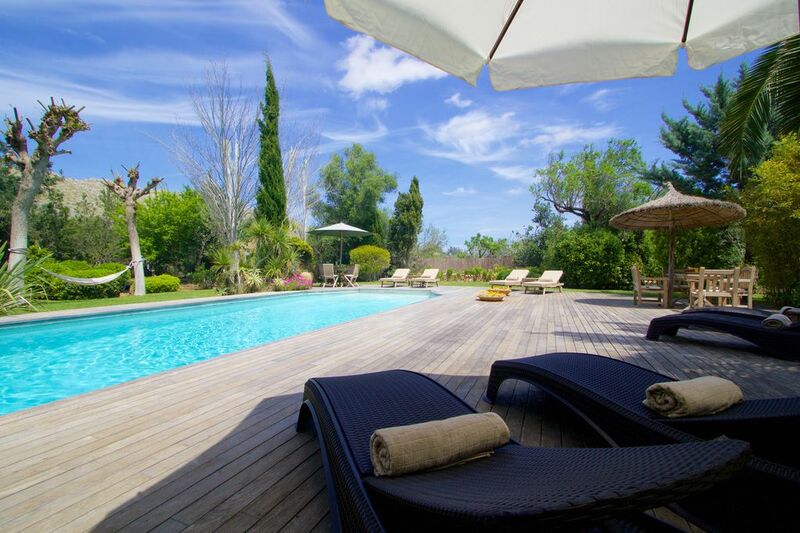 Truly possibly the loveliest garden and pool area on the rental market in the north of Mallorca. Our guests tell me the same and keep coming back! En-suite bathroom to bedroom 1 with bath. En-suite bathroom to bedroom 4 with bath. Full bathroom with twin sinks and bath for bedrooms 2 and 3. Guest WC downstairs. WC for pool area. IB Red, fastest internet possible for the area. Bath and swimming towels provided. Living room (Sun Room) and UK and International TV sitting room, DVD player, Wii, PS4, DVD library. Board games. Fully equipped kitchen including cooker, gas hob, full size fridge, separate full size freezer, dishwasher, microwave. Dining area inside and on outside terrace. Full UK TV, Also has all international channels. Bose Stereo speaker for ipod playback. A small but varied honesty library, founded on a take one/leave one basis. A selection of cards and board games. Balls/lilos and buckets and spades. Wii plus a selection of games. Master Bedroom Romeo and Juliet Balcony. Boat Hire available, 5 minutes away in Port de Pollenca. Tennis courts very near by in Pollenca. Just 7km from Pollenca Golf Course, and 17km from Alcanada Golf Course. Both are stunning courses. 10 X 5 metres, Roman steps. Decked pool area. Notes on accommodation: Sky TV, DVD, DVD library, WIFI Internet throughout. Bicycles for exploring the lovely country lanes. Outside: Table-tennis. Large private swimming pool. BBQ. Very private setting. The property in accesses through a private electric gate and there is parking for 5 or more vehicles. The Finca has a beautiful and envied mature garden made up of lemon, orange, fig, apple and almond trees as well as vines and bougainvillea. There is a wonderful outside dining area and beyond the house is the large teak decked pool area with enough teak pool furniture for everyone. Beside the pool is the pool house with sauna, utilities and WC. At dusk the garden is brought to life with a spectacular array of garden lighting. The Pool is 10 metres X 5 metres. Utility Room: Washing Machine, Tumble Dryer, Sink, Iron and Ironing board, Cot, Highchair, Cleaning / Towels / Linen / Maid service: A maid service is provided within the price, which includes weekly towel & linen change and end of stay Cleaning. Daily cleaning/maid service can also be negotiated. Other: Covered BBQ and Wood burning oven area with sink. Outdoor pool WC. Covered Table Tennis area. This is the second year staying at Font Xiquita. As soon as we passed through the gates and caught sight of the villa and gardens, we relaxed. The villa is well furnished with some antique pieces, plenty of seating areas and comfortable beds. The kitchen is well stocked with pots and pans. It is a short drive to the supermarket, Pollensa and Puerto Pollensa. Thank you so much for your great review. I'm so glad you had a great stay and we'd love to see you again next year! We took our family to this beautiful villa in June. It certainly lived up to our expectations. The villa had everything we needed. The gardens were well kept and colourful. The pool was bigger than I expected and ideal for the children. It was only a couple of miles to the nearby supermarkets and towns so very well situated. The House Manager came around to see if we needed anything and gave us some recommendations for restaurants/bars which we subsequently booked and they were all very good and reasonably priced. We would certainly love to go again and would have no hesitation in recommending it to anyone. The villa is a lovely property with a lot of character however it is over priced. After viewing the pictures and description of this villa we were prepared to pay a higher price compared to other similar sized villas we have stayed in. The property has a lot of character with large rooms and a pretty garden. The owners have obviously spent alot of money and in many respects have created a higher end finish. We did enjoy our stay but we did not consider it value for money as there were a number of issues that need to be addressed. The trees/shrubs have been allowed to grow so big that by 5pm there is no sun on any part of the garden and the pool is constantly being filled with twigs/leaves. As so much shade is created it was impossible for us to sit outside after 5pm without being bitten to death by mosquitoes. The villa is for 8 but there were only 4 covers for the sunbeds which were very mouldy. The electric gates have no manual override so when we had 2 power cuts we were unable to leave the villa by car and a person could only leave by climbing over a fence through shrubbery. The sprinklers were set to be on so late that all of the grass and furniture around the pool were soaking wet every morning which was unpleasant. The bikes provided are a great idea but it would be useful to add baskets on the front so they can be used for supermarket visits. The BBQ area is situated in a dark alley, away from other outside areas which makes it unappealing to use. The inside of the villa is dark compared to the pictures on the website but you do benefit from a cool temperature. The bedrooms are lovely but be aware that anyone sleeping in the downstairs bedroom needs to be a good sleeper as there is a constant hum from a generator outside if the air con is being used. The fridge is large but of poor quality in that the door is very hard to open, so much so that we had to be very careful that we did not pull it over when opening it. The owners had put a sticky note on the front saying 'open with care' but this isnt really solving the problem. The numbers of crockery were small so we had to use the dishwasher more often than necessary which contradicts the numerous signs asking you to conserve water. The website offers British tv channels but you can only download specific programs. Quite alot of paintwork was crumbling and in need of attention. There was no light next to the key box which we had to use regularly as we were only allowed one key to the property. Firstly i'm delighted that you realised that the property is lovely with lots of character. I'm really sorry that you felt that the property is over priced and found some issues with it. Regarding price we have now reviewed all the prices and have found that the property is priced similarly to properties of the same or lesser standard than Font Xiquita. We keep a close eye on the pricing of villas in the area each year. Regarding the shade from the trees, we have never had a complaint about this in the past, as generally the mature garden has always been one of the most enjoyed parts of the property. However of course we take your comments seriously and have now cut back the foliage where necessary. We now feel the garden has just the right amount of shade, privacy and suntraps. The newly refurbished pool decking is in the sun all day, and sunbathing won't be a problem at all. With regards the Mosquitos, unfortunately there isn't a huge amount we can do about those. We're confident they're no worse at Font X, than anywhere else, however we will supply plug ins, spray and candles to help. We have full NowTV including Movies, Kids and Sport and all the British catch up TV channels, as well as a number of classic movie DVD's in our library and a PS4 with games. I appreciate the problem with the gate and have now put in a manual override. We will look at putting baskets on some of the bikes. We have now replaced the fridge, and we have replaced, bought and improved all of the crockery, glassware, cutlery, and plastic versions of all as well as many other kitchen utensils. The house will be repainted and in a fantastic state of repair for the new season. I will also investigate the noise of the Air-con unit and repair/replace if necessary, although I can assure you there is no generator on the premises. In terms of the key, i'm sorry to hear you felt you were only 'allowed' one. We would have been more than happy to supply a second key. Kim our house manager is always on hand to help, and she would've been delighted to give you another key. We truly want to make sure you have the best stay possible and will always do everything we can to ensure that. Again i'm sorry you didn't feel that your stay was value for money. As I have mentioned we have looked at these points and addressed them all. We welcome feedback and I can assure you of our best intentions in the future. Very well equipped villa. Comfortable beds and Egyptian cotton sheets. All very clean and welcoming. Thanks so much for your review. I'm delighted you had a great stay. Please do come again! Thank you so much for your review. We are delighted that you had a wonderful holiday and that Font Xiquita lived up to your expectations. Thanks again and please do come again! Simply the loveliest country house in Mallorca. My wife, two daughters, grandchildren and I have just returned from a wonderful week staying at Font Xiquita. The website describes it as the loveliest country house in Mallorca and I can't imagining there is a better one anywhere on the island. The semi-rural setting is delightful: close enough to the amenities in Pollenca but far enough away to offer complete privacy. The pretty house is very comfortable and well equipped, the extensive garden beautiful, and provides plenty of shade, and the large swimming pool, with it's decking surround, ideal for children. The 4 bikes provided are perfect for exploring the local countryside and there is a well- equipped barbecue for self-catering evenings spent at the house. Helpful information about the house and the surrounding area is made available. Thank you Angus for making your house available to us for such a memorable week. We hope to return next year. Many thanks for your wonderful review. I'm so glad that you and your family had such a great stay at Font Xiquita. It really is fantastic when we hear that our lovely house has made a good impression on a family. Of course I will make a note for a booking next year. If you fancy doing some fitness whilst on Holiday we offer Personal Training to any standard. For more active holidays, there are numerous activities available to you around this area including trekking/hiking, climbing, rock scrambling, swimming, scuba diving, snorkelling, abseiling, paragliding, helicopter tours, Balloon trips, mountain biking, kayaking/canoeing, caving and horse riding. All of these activities are available here in the north of Mallorca. Less than 10 minutes drive to the beaches of Cala St. Vincente and Pollenca Bay. 40 minutes from Palma airport. Hire Car recommended. To take the stress out of arriving we can pick you up from the airport and bring you to the Finca where you will find a hire car waiting for you. Pollenca 3km. Puerto de Pollenca 4km. Alcudia 9km. The charming market town of Pollenca has everything you need, Supermarkets, Banks with ATM's, Post Office, Deli's, and great boutiques. The Campanet caves nearby are well worth a visit. We can organise a boat trip for you to nearby bays. Let us be your concierge whilst on holiday. We can organise anything you need from Food Shopping, Baby sitting, Massage, Personal Fitness Training, restaurant booking and anything else you can think of. Booking Notes: Contact owner for availability. 25% deposit required on booking. Balance 10 weeks before arrival. £400 Breakage deposit. Changeover Day: Friday changeovers preferred but please enquire if this doesn't suit as can be flexible. Notes on prices: Prices are for the property per week in £Sterling.